Provide your current and valid Florida driver’s license number or Florida identification card number. If you do not have a Florida driver’s license number or a Florida identification card number then you must provide the last four digits of your Social Security Number. If you do not have any of these items, you must write “none” in the box or field. Now, say you are registered but you didn't catch the debate this week and generally haven't been keeping up with the political campaign? That's okay! It's never too late to be informed. Get the facts with fact-checking websites like FactCheck.org and PolitiFact.com. My favorite way to stay informed is the easiest way; I simply listen to National Public Radio in the car while driving to work and class. It makes me feel like I'm not wasting the thirty minute commute! Many college students have a set back that you may have too: does your state ID have your parent's home address on it and not your temporary college apartment address? This makes it difficult for you to register and vote in the county that you are currently residing (due to the GOP pushing for stricter voter registration requiring a state ID to match the county in which you're voting, oops). Don't let this stop you from casting your vote! You can still vote by mailing in your ballot, it only takes a second from home. Just Google the steps that your state requires you to take. 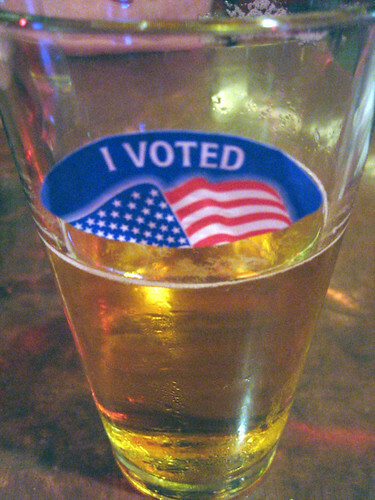 Go and vote on or by November 6th, get your cute sticker, and have a beer. This is coming up so quickly! But you're right, awfully important. Atta girl! Get the vote out! It's so important to vote, our generation is no where near as active as we should be. It's so easy to register! 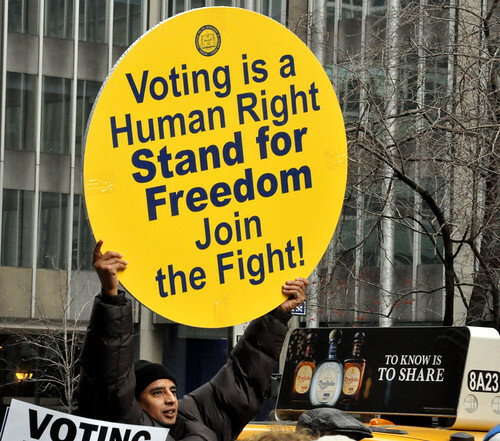 I live in Philly, and thankfully that nonsense voter ID law just got pushed back. That's so fortunate for Philly! I have so many friends that I worry just might get lazy about voting because they have to absentee now. Thanks for your comment! Cool that you found me :)! Here in Europe everybody is soooooo exicted about the upcoming elections in the US. I think we are discussing US- poltics more than EU-politcs even though Europe is in crisis. But these elections are so important! So very important! I find it interesting that the EU makes a point to stay involved with our politics, yet in America, we rarely report on your politics! Except for the fact that Sarkozy is short, that's the only thing we really seem to report about. Hey Yelle! In Europe we follow the USA election with a lot of interest. I like to read how you see it. I like also your blog to know a bit USA not just as a tourist. Greetings from Spain!